preserve history and heritage in Archery, Ga.
TAMPA, Fla. -- You, your family and community constitute an important part of history -- every story a puzzle piece that completes a picture important to the future, for descendents and researchers alike. If you come from a community that has been overlooked by historians, this would be the time to set the historical record straight as sources and their memories begin to fade. Such work can be time consuming, but enormously rewarding as University of South Florida Anthropology Assistant Professor Antoinette Jackson knows all too well. She is navigating both sides -- the work and the rewards -- through three projects she’s directing concurrently in Florida, Georgia and Kansas, one of which has connected her to a former U.S. president. Jackson is working with the National Park Service and the Jimmy Carter National Historic team to make sure that a previously ignored community near President Carter’s boyhood home and its people establish their place in history, before it’s too late. Jackson’s work has Carter’s personal attention and the nation’s 39th president is both excited about and supportive of her research efforts in a relatively new discipline -- heritage studies. Based on her growing reputation, Jackson was tapped to serve on the Gullah/Geechee Cultural Heritage Corridor Commission in 2007. The commission was chartered to oversee the implementation and management of a federally-designated corridor’s “places, things and traditions” as part of the National Heritage Areas Act. The corridor stretches from Jacksonville, Fla., to Wilmington, N.C. With these credentials, she was also the obvious choice for a grant to study Archery, Ga., a town that played a role in President Carter’s life. Jackson’s work involves collecting oral histories from the ranks of those who constitute a bridge to the early 20th century as they grow thinner each year and time is running out to gather their memories and private archives for research. The most high profile of her three projects has involved interviewing the former president. Fortunately, Carter’s memory is sharp and his interest in her project very keen. He spent a considerable amount of time sharing stories and information about the community and its history during their interview session. Jackson also has been able to talk with a number of people in their 70s and 80s about the community, though sadly, many others are no longer able to provide the stories key to reconstructing the life of a once-thriving town located near Carter’s boyhood farm in Archery, Ga. It is the town of Archery’s proximity to that farm -- on the Sumter county side -- that put it on the U.S. Department of the Interior’s radar, but locals have informed Jackson that Archery was a thriving town long before the Carter family established its roots. You wouldn’t know that from looking at Archery today. When Jackson first arrived in what a map designates as Archery, all she found was a plaque and a dirt road. A short distance from these none-too-promising signposts, old abandoned buildings dotted a landscape dominated by grassy areas and clusters of trees. Undaunted, Jackson knew she was there for a good reason. The Department of Interior National Park Service Southeast Region ethnography program initiative along with encouragement from senior faculty members in the USF Department of Anthropology to bid on the project brought Jackson to Archery. 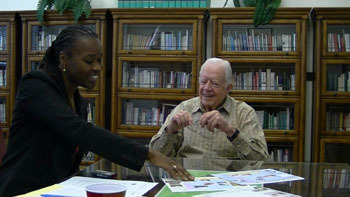 Once there, NPS personnel and a local church elder were instrumental in getting her started on her quest and putting her in touch with President Carter. A little nervous about their meeting, Jackson asked for guidance from the people in Plains who know the former president, but was told not to worry. And she found Carter to be just as relaxed and friendly as everyone said he would be. He came well-prepared and had as many questions for her as she had for him and an interview that was scheduled to last only 15 minutes turned into nearly an hour of scintillating conversation. Dressed in a suit and ready for pomp and circumstance, Jackson found everyone around her at the Jimmy Carter National Historic Site, located in Plains High School, casually dressed, relaxed and going about business as usual. With two of her students and her uncle standing by, Jackson heard someone say, “Welcome, Mr. President.” He walked in casually dressed as well, without fanfare and with that she simply went with the flow. Jackson showed him her charts and power point presentation drawing comments from him along with questions and suggestions. Split between two counties, Archery’s records are split between two courthouses. Jackson also turns to the local libraries, newspaper archives and online census data to fill in more details of life in Archery. But face-to-face personal contact can be rewarding in an entirely different way. “In talking to people, I find that material records and nature markers such as houses, farm tools, court records, census data, maps, flowers, trees, creeks and other such things come to life and become embodied with meanings and feelings,” Jackson said. Church Deacon Milton Raven hosted a reception to introduce Jackson to what’s left of Archery’s community. Representatives from the Park Service, Steve Theus and Allison Pena, drove her around and gave her a tour of the area. Gary Ingram, Jimmy Carter Historic Site superintendant, helped set up the interview. What she learned was that during the 1920s, 30s and 40s, Archery was filled with thriving businesses, prosperous households and influential citizens. It was the home of the Johnson Home Industrial College and a printing business owned by African Methodist Episcopal Church Bishop William Decker Johnson, a man who became a world-renowned educator. Railroad workers were its core while farmers, farm workers and domestics formed its backbone. Jackson is trying to find out what caused the town to bloom and what caused it to dry up and wither away. She conjectures at this point that the absence of resources to incorporate technology into their farm practices and changes in the railroad system were factors. But the reasons for Bishop Johnson and his school’s disappearance from the scene remain a mystery she hopes to solve somewhere down the road. In the meantime, collecting oral histories has moved to center stage -- something she encourages everyone to do, whether they are her students or not. The ability to take digital photos of family pictures and records makes her job a lot easier these days when dealing with people who would be reluctant to let items out of their possession -- even for a good cause. Jackson’s Kansas and Sulfur Springs, Fla., projects follow a pattern developed with Jackson’s very first one in the Spring Hill section of Tampa, an African-American neighborhood near USF covering five square blocks with a long and storied history dating back to the late 1800s. They talk to people and they dig through documents -- one by one. Jackson and her graduate students have been presenting their findings at national conferences and are developing and publishing articles. Together they are establishing USF as a center for heritage studies on a national level through their focus on the anthropology of American culture. Graduates of the program are sought after by other institutions interested in setting up similar programs or simply interested in hiring students with skills in heritage research on a community level. These are some of the rewards.